Neatened up since then though! I hit my nail once, if you look on the lid there's a curved bit of plastic, just put that bit by the nail bed. 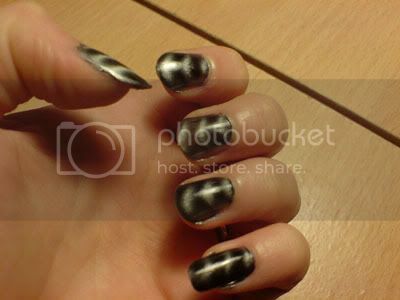 I found the longer you leave the magnet over it the more distorted the polish becomes. I saw this the other day and was wondering if any of you ladies tried it! It looks awesome, I'll have to find me some. Looks awesome! I just learned about that polish and definitely wanted to try it if I could find it, was wondering if anyone else had used it yet. Pretty pleased with it, the magnet thing is easier than I was expecting, or perhaps I have a steadier hand than I thought! Ok, so I haven't been on here for a long time. 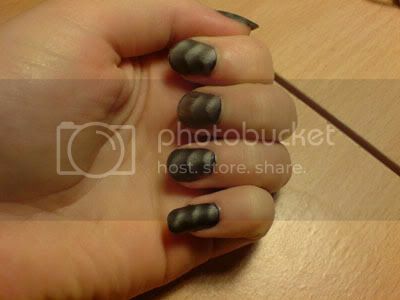 But I have done some recent things, so I am going to post some nails, sorry for the crappy web cam pics! ok here we go. First off my Zombie-ish nails. layed down a layer of "Antique Blue" Followed by purple, then the pink, finally some black. The webcam distorted my lines, again, sorry. And then I did these today, I got the text out of old court papers. On my pinkies are my area code 419 Middle finger Savage vs. (keep name confidential) thumbs say Justice, just thought it was neat. I have posted a tutorial for how to do this in the "tutorials, everything else" forum! Ooooh, I contemplated matting mine, as I'm wearing it again. You've just convinced me to do it! Model's Own Pinky Brown from the Beetlejuice collection. I've since mattified it and it looks even better. DreadstarMonstar wrote: Ooooh, I contemplated matting mine, as I'm wearing it again. You've just convinced me to do it! I've been thinking the same! My nails need redoing anyone. Has anyone tried placing the magnet in a different place? See if it brings a different effect to the polish? I'm tempted to give it a go tonight and see if it works. EDIT: I tried placing the magnet on the side of a nail instead of at the bottom, it looked pants. Last edited by foximusprime on Thu Nov 10, 2011 11:37 pm, edited 1 time in total. Yeah in the uk but you can only get boots items delivered in store if you spend over £20 anyway I got the 17 magnetised Sunday the same day I got m&s rainbow which is like gosh 549 but not quite as wow. The magnetised has all but rubbed off! I think it may be the worst staying power of a varnish I have ever experienced. M&s rainbow is pretty much still completely on, doing well and looking great. I should take a photo! Collection 2000 "smash" in black (I also bought the white & the sliver) Rimmel in Azure blue. I've added a matte top coat, but you can't really tell. Monique_marion_may wrote: I need the croc effect. As do I. I'm not supposed to be buying things for me though so close to xmas. I need to focus on others. Illamasqua Harsh, based on their Christmas look tutorial only I couldn't be bothered doing a black base first. Ooh that is very glittery!! I've got the really light turquoise one - it's gorgeous! How you turned my world, you precious thing You starve and near exhaust me Everything I've done, I've done for you I move the stars for no one!